A short sale is a real estate sale in which the profits made are less than the existing loan on the property. A short sale typically occurs at or below market value and is successful only when the lien holder agrees to accept less than what’s owed. Short sales commonly occur when a seller is in financial distress. LendingHome is a hard money lender that helps investors finance short sales with short-term loans. Interest rates are typically between 7% – 12% and their loans can finance renovations. They offer loans up to 90% LTV and up to 75% ARV. A short sale is a great opportunity for real estate investors to buy underpriced assets. However, many investors have trouble understanding how to buy a short sale. To help, this article discusses buying a short sale, including what a short sale is, how to finance it, as well as the general short sale buying process. A short sale gets its name due to the fact that the seller is “short.” This means that the amount owed on the home is more than its fair market value and that the borrower is in financial distress. For example, if a borrower has an existing loan balance of $200k on a property appraised at $150k, he or she is short by $50k. When this occurs, lenders will sometimes be willing to let the borrower list the house for sale at a price that’s lower than the debts currently owed. This is because a short sale typically means that a seller is 90+ days delinquent on their loan payments and lenders want to recoup as much of their investment as they can. For this reason, short sale proceeds go directly to the lender. In the example above, the borrower would sell the property for $150k. The entire $150k sales proceeds would then go to the lender as compensation for the short sale. When a seller is short, they can list their property as a short sale using a normal listing agent. It’s common for short sales to be listed below market value since sellers aren’t held liable for the amount they’re short and buyers are looking for a deal. However, while a seller can list a short sale without their lender’s approval, the lender must agree to accept less than what’s owed on the current loan and can deny a buyer’s short sale offer. Lenders are motivated to recoup as much of their investment as possible and thus like to see offers at-or-near fair market value, if possible. If any of the above parties fail to agree the short sale falls apart. However, because of financial distress, banks and other lien holders are typically in the driver’s seat when it comes to a short sale. It’s therefore common for a buyer and seller to agree to a short sale but much harder to get a lender to agree to take a loss. Short sale properties are sold as is. This means that a property can be in either good or poor condition. Further, a short sale can take anywhere from 1 – 6 months to receive approval from a lender. Let’s take a look at how people like the ones above find a short sale investment. Short sales are listed for sale just like any other type of property available for sale. This means that you can find a short sale listing through normal means, such as with realtors or listed in online databases. Let’s take a look at the 2 main ways you can find a short sale house listing. The best way to find a short sale listing is to use a real estate agent as if you were looking for a normal investment property. Realtors should be able to set up a short sale search in MLS and send you properties based on your criteria. Another great way to find short sale listings is by doing a little of your own legwork. With online platforms such as Zillow and RedFin, it’s possible to see short sale listings yourself. These platforms typically list short sales along with suggesting asking price. Other listing websites such as Auction.com and RealtyTrac.com have short sales that you can search for yourself. Even Foreclosure.com has a section for “preforeclosure” listings, which is a fancy way of saying short sale. However, these two ways to find a short sale aren’t mutually exclusive. Ideally, you’ll be able to both work with a real estate agent as well as search for short sale properties yourself. Buyers looking to purchase a short sale can typically finance the property using short-term loans as well as longer-term permanent loans. These loans include such things as balance sheet loans, hard money loans, as well as cash out refinances. This means that financing a short sale is very similar to financing other types of investment properties. For example, while it’s possible to finance a short sale with an FHA loan or something similar, investors typically don’t qualify. To help you better understand how to finance a short sale investment, check out the table of short sale loans below, as well as detailed explanations of each. A short sale balance sheet loan is a loan kept on a lender’s balance sheet as an investment. Balance sheet loans are different than other loans in that they’re not sold on the secondary market and are therefore more flexible. This makes them “non-conforming” loans that don’t adhere to Fannie Mae standards. Balance sheet loans can finance single properties, apartment buildings, and multifamily properties, as well as act as blanket mortgages that finance multiple properties together. Short sale balance sheet loans are therefore right for many different types of investors. However, balance sheet loans typically can’t finance properties in poor condition. A short sale balance sheet loan typically has a maximum loan amount equal to 80% of a property’s purchase price, known as its loan-to-value (LTV) ratio. Some lenders will also have a maximum dollar amount for their balance sheet loans, but not always. This means that investors buying a short sale should expect to cover at least 20% of the short sale’s purchase price as a down payment. However, depending on the lender, it’s possible to receive a higher LTV amount and therefore a lower down payment. Short sale balance sheet loans typically have interest rates that range from 4% – 6%, on average. The specific interest rate will vary depending on the lender as well as the type of balance sheet loan. For example, an apartment loan or multifamily loan might have a lower interest rate than a loan that finances a single short sale property. These costs are typically taken directly out of the loan. Balance sheet loans might also have a 1% prepayment penalty. However, since these balance sheet loans vary by lender, it’s important to check your lender’s specific fee structure. Balance sheet loans have a lot in common with conforming loans such as Fannie Mae-backed loans. For example, balance sheet loans typically have terms between 15 – 30 years, making them a long-term permanent mortgage. Also like conforming loans, short sale balance sheet loans typically take 24 hours for pre-approval and up to 30 – 45 days to receive financing. However, since it takes between 1 – 6 months for a short sale to get approved, the funding time is not a huge issue with financing. Like with any property, lenders will most often conduct an appraisal of their own to ensure the sale price accurately reflects the property. Investors can find short sale balance sheet loans with most banks and lenders. This includes big banks, local banks, online lenders, mortgage brokers, and more. For example, Chase Bank has traditional commercial balance sheet loans specifically designed for real estate investors. Other services such as Rocket Mortgage can help investors with online balance sheet loans. Even lender marketplaces such as LendingTree help investors by connecting borrowers with lenders who have balance sheet loans. A short sale cash out refinance occurs when an investor takes out a new loan on an existing property to unlock equity in that property. What typically happens is that an investor uses a new loan to pay off an existing property’s current lien. The difference between the new loan balance and the existing loan balance is pocketed as cash and used to make other investments. Short sale cash out refinances are right for longer-term buy-and-hold investors with existing properties. However, a cash out refinance is typically only a good option if the investor has between 30% – 40% of equity in an existing investment property. Cash from a cash out refis can be used to make a down payment, purchase a property all-cash, or cover renovations. A short sale cash out refinance typically has a maximum loan amount equal to 75% of an existing property’s fair market value. This is because a cash out refi takes out a new loan on an existing property and lenders aren’t concerned with the price and value of the new property being purchased. Cash out refinances technically don’t have a down payment since the loan uses an existing property as collateral. However, it’s important to note that an investor typically needs between 30% – 40% or more of equity in an existing property to make a cash out refinance work. Since cash out refinances are offered by many different types of lenders, interest rates vary. For example, it’s possible to find cash out refi with interest rates between 3% – 6% or more. Origination fees and closing costs are usually taken directly out of the loan. Even though you’re taking out a loan on an existing property, you’ll still need to pay closing costs due to the fact that the lien will be a new one. A cash out refinance typically has a term between 15 – 30 years. This is because the new loan taken out on the existing property is a permanent mortgage. The time to pre-approval for a cash out refinance can take as little as 24 hours and funds can be received in 30 – 45 days. Remember that a good rule of thumb is that you should have at least 30% – 40% in existing equity if you want to use a cash out refinance. Otherwise the lender, even lending against the maximum LTV, would not be able to extend you much credit. Cash out refinances are offered by most lenders that have permanent-type loan products. For example, national lenders such as Quicken Loans offer cash out refi options that can be used to purchase a short sale, put a down payment on a short sale, or renovate a short sale property. More traditional banks such as Union Bank & Trust also offer cash out refinances. A short sale hard money loan is a short-term loan used by investors to purchase and sell a property within 1 – 3 years, if not sooner. Hard money loans are issued by hard money lenders who typically have low qualifications for approval. Hard money loans can come in the form of rehab loans that finance the purchase and renovation of a property. This means that short sale hard money loans are best for short-term investors looking to fix-and-flip a property. However, hard money loans are sometimes used by long-term investors who need to renovate or season a property before refinancing. These properties can be purchased in good condition as well as in poor condition. Hard money loans have maximum loan amounts based on a property’s purchase price or expected fair market value after renovations. A property in good condition can be financed up to 90% of its loan-to-value (LTV) ratio. A property in poor condition can be financed up to 80% of its after-repair-value (ARV), which is the fair market value after repairs. This means that an investor should expect to cover at least 10% of a property’s purchase price if it’s in good condition. If it’s in poor condition, investors should expect to cover at least 20% of the property’s purchase price plus renovation budget. An extension fee is assessed if a borrower can’t pay off the full loan at the end of its term. Prepayment penalties also often exist to protect the lender against early repayment. Origination fees and closing costs are taken out of the loan while extension fees and prepayment penalties usually come out of pocket. The typical term of a hard money loan is between 1 – 3 years. However, many fix-and-flip investors try to purchase, renovate, and sell a property within 3 – 6 months. This means that investors either pay the 1% prepayment penalty or work with a private money lender that doesn’t have a penalty. The time to it takes to get pre-qualified with a hard money loan can be as little as 3 minutes. The time to funding is typically between 10 – 15 days. This makes hard money a great alternative for investors who can’t qualify for a long-term loan. What some buy-and-hold investors do is use a hard money loan to purchase, renovate, and/or season a short sale property before refinancing to a permanent mortgage later. Hard money loans are offered by hard money lenders and private money lenders. For example, if you’re looking at a residential short sale property, you can get a hard money loan from LendingHome or someone similar. It’s possible to find an online hard money lender for almost any type of situation. For more information, you can read our guide on the best hard money lenders. Buying a short sale is a good idea because short sales are commonly sold for less than a property’s fair market value. This means that real estate investors can purchase an underpriced asset and either rent it out long-term or fix-and-flip it as a short-term investment. There is good profit potential with buying a short sale. This is why you don’t see many short sales going for a property’s fair market value. An investor is interested in getting the lowest possible price and while banks want to minimize their losses, lenders also know that they’ll make less in a foreclosure auction, which happens if a borrower defaults. Since investors typically have a maximum allowable offer in mind, lenders will try to get as close to fair market value as possible but eventually settle for less. However, this doesn’t mean that all banks eventually accept a short sale offer. It’s not uncommon for lenders to refuse a short sale in the hopes of earning more at a real estate auction. 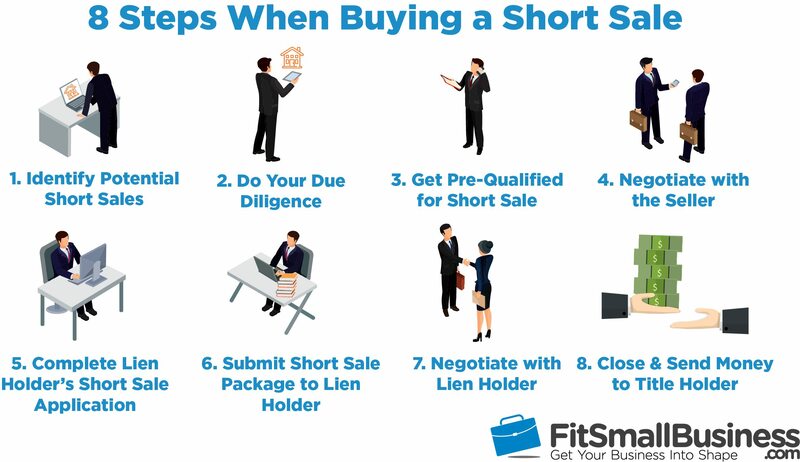 There are typically 8 steps to the short sale process. These steps make the entire short sale process, from searching for properties to closing the deal, takes roughly 1 – 6 months. Specifically, the 8 steps include property identification, due diligence, funding pre-qualification, negotiations, short sale applications, short sale packages, and more. The first step is to work with real estate agents as well as look online for potential short sale listings. You can re-read our section on how to find a short sale, above. The next step is to view the potential properties and assess their current conditions. For the properties you want to purchase, you’ll have to run a title search to see who the lien holders are. Once you’ve identified a short sale listing to purchase, the next step is to figure out your maximum budget by getting pre-qualified with a lender of your own. You can get either short-term as well as permanent financing. There are two negotiations that take place when buying a short sale. The first is the negotiation with the seller where you agree on a purchase price that’s below market value and below the existing mortgage balance. Once a price is agreed on by the buyer and seller, the buyer or buyer’s real estate agent will have to contact the lien holder’s loss mitigation department or resource recovery department and fill out a short sale application. After the short sale application is completed by the buyer, the buyer and seller will need to assemble a short sale package and submit it to the lien older along with the application. This proposal includes a purchase contract, a hardship letter outlining the seller’s financial hardships, the property’s appraised value, and a settlement statement. It’s not uncommon for the lienholder to reject the buyer’s initial short sale offer. If this happens, the price is negotiated between buyer and lien holder. It’s during this time that the lien holder will often get an independent broker’s price opinion on the property. Once a sale price is agreed on between the lien holder and the buyer, the short sale closes and the buyer wires funds to the title holder. It’s up to the seller to settle their debts with the lien holder. A short sale is a real estate sale that helps investors purchase underpriced assets. This is because a short sale typically occurs at or below market value. However, a short sale is only successful when the existing lien holder agrees to accept less than what’s owed. Short sales therefore occur when a seller is in financial distress.